A.Y. Jackson first saw Lake Superior with Lawren Harris in 1921, when they traveled to its north shore, and while Harris was transfixed by its stark, dramatic vistas of lake and sky, Jackson was drawn to its rocky hills and small pools. Jackson declared, "I know of no more impressive scenery in Canada for the landscape painter," and for the next few years, the North Shore was a regular destination. Later, the eastern shore became one of his regular painting places after he built a cabin in 1955 at Twidale Bay. He sketched there frequently during summers in the 1950s and 1960s, painting more intimate scenes of Lake Superior, with waves lapping its rocky shores and small beaches. 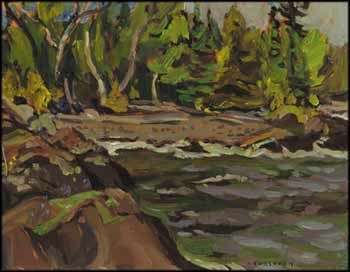 Lushly painted, this work is dominated by a palette of green and brown tones, but close scrutiny reveals Jackson's bold use of colour, with strokes of pink and mauve in the tree trunks, dots of bright blue on the rocks, and in the water, strokes of mauve and grey, animated by a sliver of brilliant emerald at the edge of a wave.